As Bike4Breath approaches we here at Team WeLikeToBike are getting ready for our 100k ride. Part of getting ready for the ride is knowing the route and the total ascent we will encounter. Difficulty: A few tough climbs with a lot of rolling hills and flats. 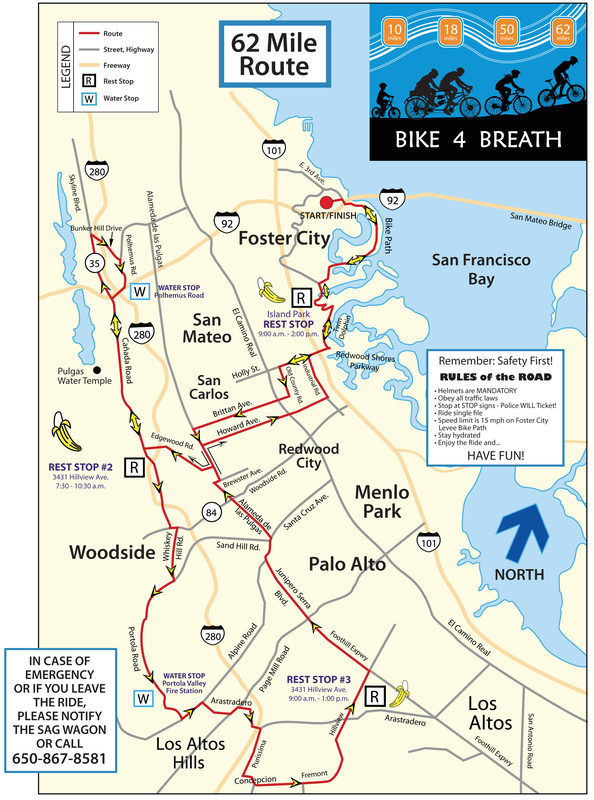 The route through the Peninsula will take us by the Bay on a bike path, over US-101, through neighborhoods, past Crystal Springs Reservoir and through parts of the Stanford University campus. Team WeLikeToBike is getting ready for this ride in our local area over the next couple of weeks by training after work with 50k rides and full 100k rides over the weekend. You can use a program like Map My Ride or Bike Route Toaster to plan and view your training route, the climbs and get a printout of the directions for your ride. We use a Garmin Edge 800 to keep us on track and record the route as we ride. We’ll make sure to post a re-cap after the event.